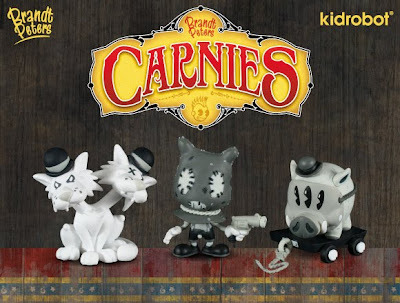 Introducing the much-anticipated mini figure series by Brandt Peters x Kidrobot: the Carnies! Stylistically reminiscent of early 20th century animation, each of the 13 carnies in this nightmarish mini-series, including the two chases, stand at 3-inches and are colored in grayscale. The skies darken, the wind howls, and you're drawn to the ominous carnival that mysteriously appeared overnight in the middle of the cornfield. The fairgrounds are populated with creatures that possess a sinister cuteness. Ladies and gentlemen, boys and girls, step right up and experience the mysterious and eerie carnival inhabited by Brandt Peters' Carnies. 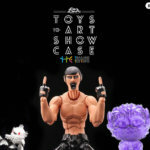 We are selling full sealed cases of 16 pieces, which ship FREE within the US, as well as individual blind box mini figures. The much-anticipated Joe Ledbetter pillowcase collection is scheduled to arrive around April 20th. We'll put up preorders for all 3 styles the week before. They'll be around $28 per pair. 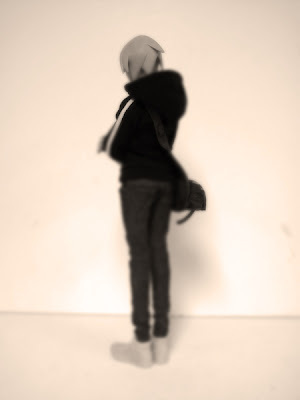 Seen on SpankyStokes: a teaser pic for the upcoming ThreeA Little Shadow figure, dropping March 18 @ 5pm pacific time. Caught this image uploaded by Matt Jones of Lunartik: an image of the mini Cuppa Teas he's developing. They'll be sold blind boxed and they look to be about the same size as those little Qees in the background: 2.5 to 3 inches tall. Ridiculously cute. No set date or price yet. More images on his Flickr page. I was forced to repost this because I love this sculpt and I love Dok A's customs.